This book was weird and it just so happens that I like weird. Gardnerville is an idyllic small town, no one gets sick, everyone lives long lives and every four years the teens in town go crazy and strange/deadly things happen. This year in Gardnerville is a 4th year. Skylar’s sister Piper was one of those teens that had strange and deadly things happen to her and Skylar can’t get past it. She thinks that since this year is a 4th year something will happen to her. Skylar was an interesting and somewhat unreliable narrator. 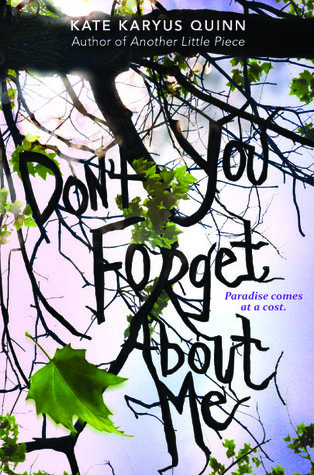 Skylar is hooked on Forget me nots and it made the beginning of the novel jump around because we weren’t really sure if Skylar was telling the truth or if it was the Forget me nots talking. I really liked the inclusion of substance abuse in (Don’t You) Forget About Me. The drugs weren’t real life ones but rather ones that were constructed out of different kinds of flowers. Still, for me, they made the story more twisty and interesting. By far my favorite part of this story though was Gardnerville itself. This is one of those towns were it is so real and tangible that it becomes a character itself. I was intrigued by the mystery surrounding Gardnerville and how the town itself changed the people who lived there. Overall, Don’t You Forget About Me was a twisty-turny thrill ride. I enjoyed the characters, the substance abuse elements, and the town itself. This was my first Kate Karyus Quinn novel but it will definitely not be my last! I was thrown with the twists involved. Sounds like really interesting book! I've seen some pretty great reviews for this so I'll need to make sure to read it at some point.